Does it flick? That's sweet work around the knot. 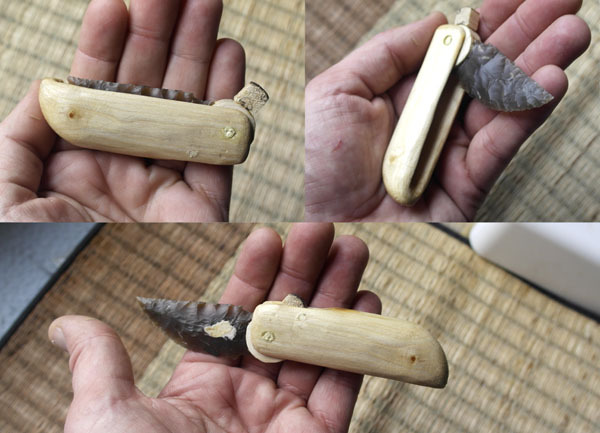 Here's a mini pocket knife I made for myself. 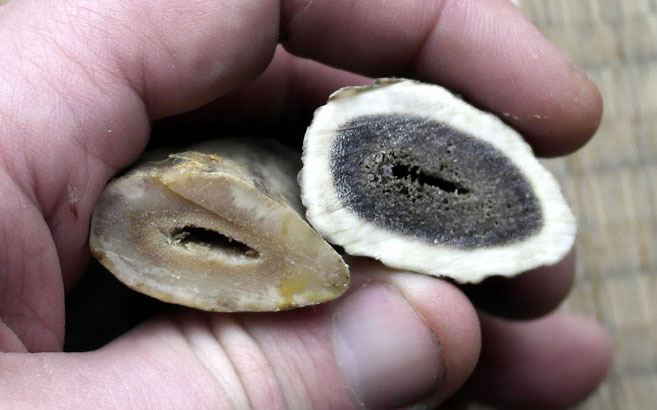 Re the softening of antler etc, i found this very interesting article.. I'm really going to have to try this. Great data on the legth of time to soak too. 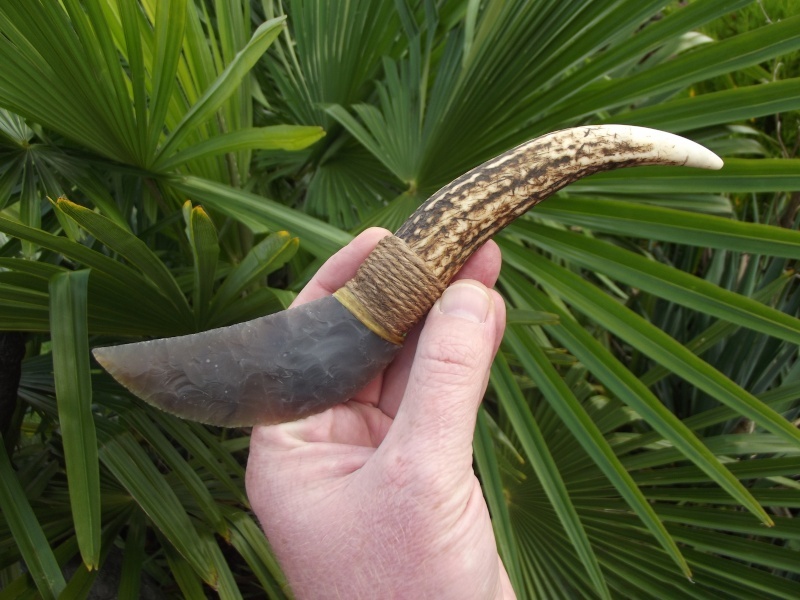 skalla wrote: Re the softening of antler etc, i found this very interesting article..
We'll tried it, soaked a whole tine on cold water for 8 days and prepared a blade to haft on it. It was the very dense kind picture below on the left. The result was a disaster, first the water and container stank(not an good idea to keep the lid on), the outside of the tine lost it's shine and looks, the inside barely softened. Basically a disaster. Bah perhaps the spongier stuff would work better. Trying to think live a cave-man, maybe they would have left it under a rock in a stream? Maybe the manky-ness of the water ruined the shine or perhaps a nice coating of bear-fat would protect it?
" 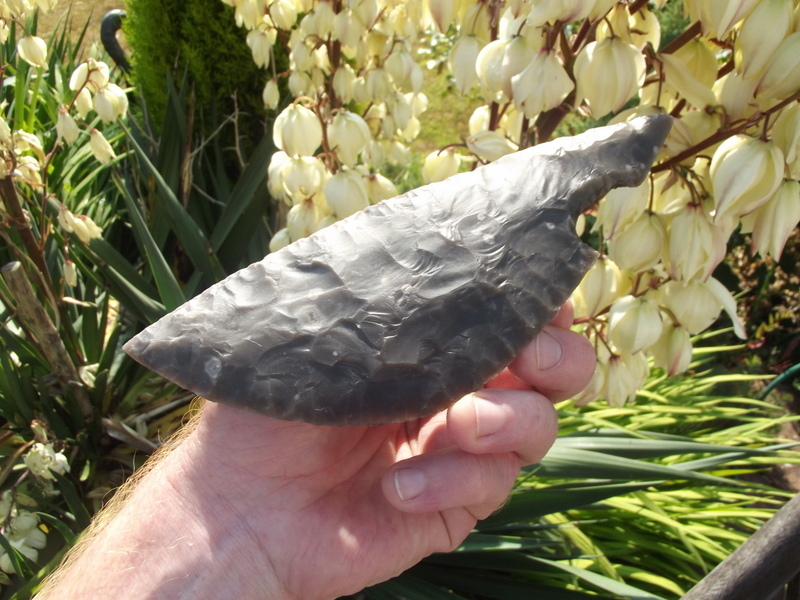 />I posted some pics of this Egpytian predynastic flint knife a while ago, and have been wanting to make one for months, so I did! I get the feeling that these had no handles, the elongated notch fits the fingers snugly. The ones in the British Musuem are about a foot long, this one is a little bit more modest! That's a beaut, but now you have told us that there are foot long versions you really will have to make one for us! To quote Jaws: "I'm gonna need a bigger boat!" Jeez man, that just gratuitously pornographic. I must read their pages more often!
" /> Well, this is one I made a few months ago. 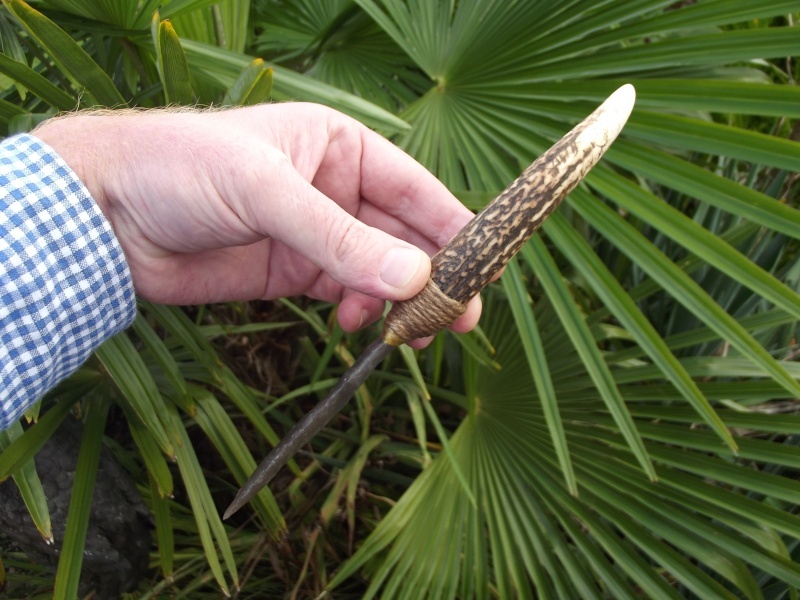 This is only the second knife with an antler handle, I kind of went for the hook in a big way. I had hoped it would sell over the summer but it didn't. The side view. A rare piece of pure black flint for me, the nodule came from a demolition site and it looks a little bit like floor stone. Sadly not much of that rock is left for me to abuse. That's a seriously straight and evenly thinned piece of rock almost as a good as a sawn slab. 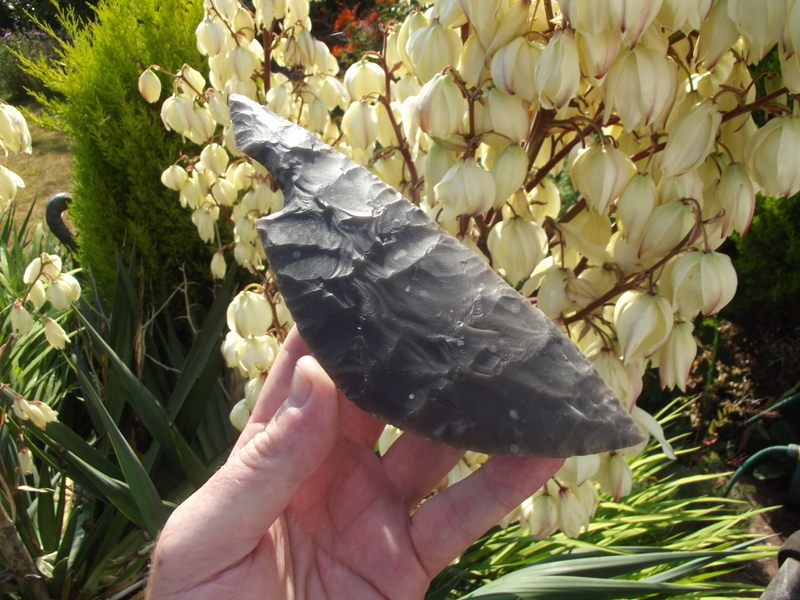 Thanks, that was knapped from a large flake struck off with a large hammerstone of Quartzite (the only use for Quartzite as far as I'm concerned!). The flake was left initially with all the cortex left on the dorsal face, you get the good black flint that lies just under the cortex and little of the inclusions that will mess up your flakes. It went thinner than I was comfortable with but it all worked out well in the end. Phew!